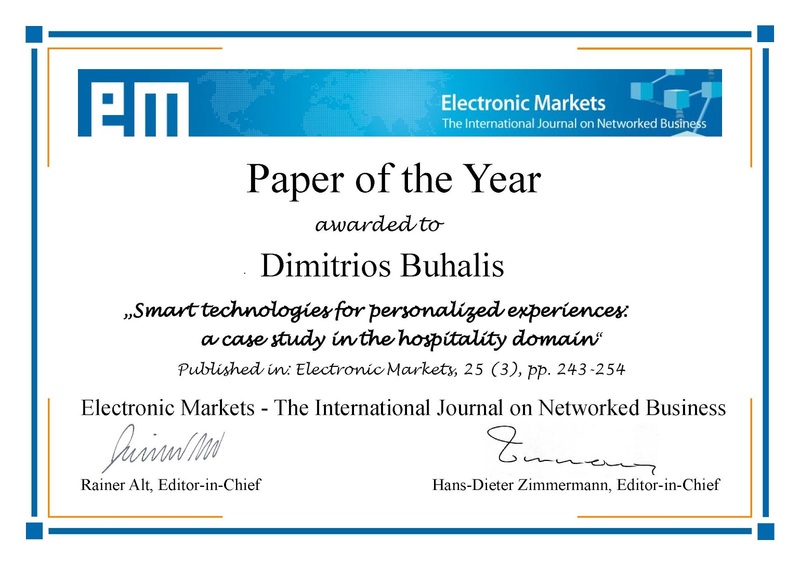 The paper of Barbara Neuhofer, Dimitrios Buhalis and Adele Ladkin ‘Smart technologies for personalized experiences: a case study in the hospitality domain, Electronic Markets, Vol 25(3), pp. 243-254, has been selected as one of the two ‘2016 Electronic Markets Papers of the Year’. has been selected as one of the two ‘2016 Electronic Markets Papers of the Year’. 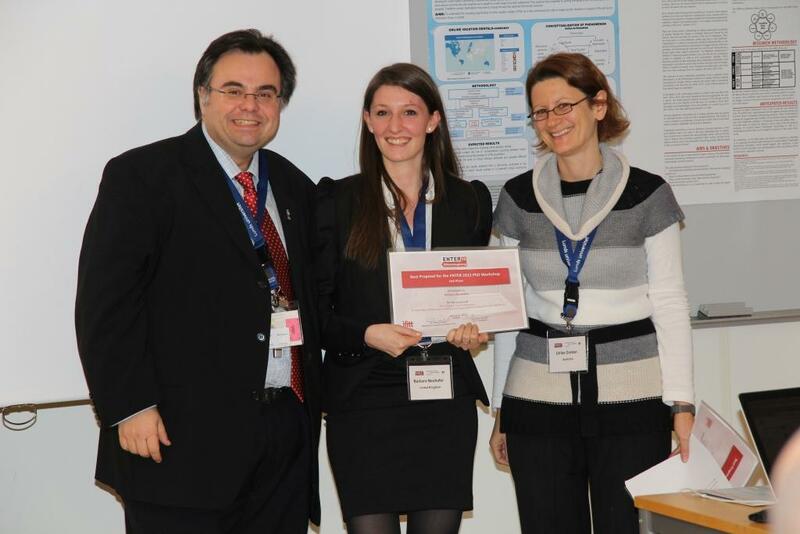 Ioanna Samakovlis, supervised by Dr Alessandro Inversini, was awarded the Master Thesis Excellence Award at the ENTER2017 conference in Rome. Ioanna explored the ways how tourism development interventions can utilise social media. The purpose of this research is to demonstrate how mechanisms of dominant narratives lead to marginalisation at the example of the Brazilian favela and how new media can give marginalised communities a voice by providing opportunities for disseminating knowledge democratically and re-shape existing belief systems. The findings of the research showed that, indeed, within the sample community voices were represented and thus, social networks such as Twitter provide a platform to disseminate marginalised narratives. Additionally, tourism as an intervention tool is clearly identifiable as a topic on social networks. Therefore, by utilising the data provided on social networks, this research demonstrates how in particular Twitter can help identify social realities and give marginalised groups a voice. Additionally, tourism businesses such as favela tours were found to be portrayed very negatively on Twitter by locals. Tourists, however, could be identified as interested in social realities of the favela. On the other hand, intervention projects with a clear community-based approach and a community origin were also seen by favela residents as an opportunity for improvement of livelihoods. 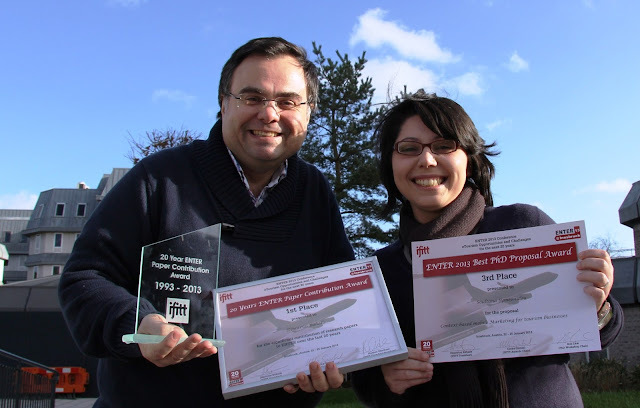 Thesis Excellence Award is presented at the ENTER 2016 conference to a Master and a PhD thesis in the field of tourism and technology successfully defended between October 1, 2014 and September 30, 2015 (ranked first, second, and third, respectively). The selection is made by the ENTER PhD workshop committee. 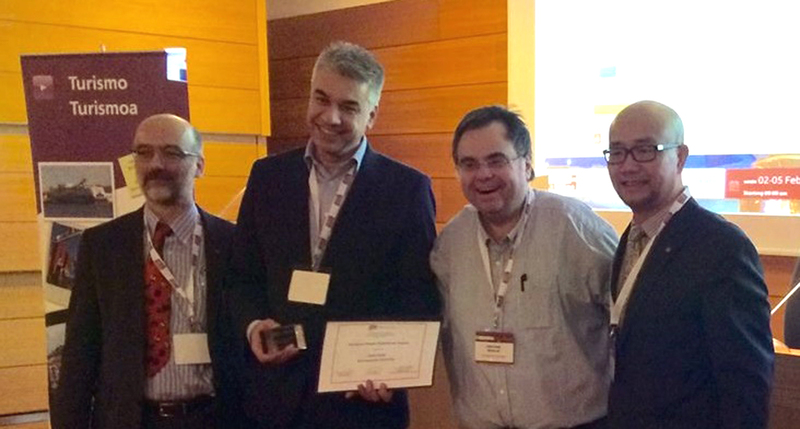 This year the award goes to BU eTourism Lab member Dr John Fotis for his PhD thesis on “The use of social media on consumer behaviour” at ENTER2016 conference at Bilbao, Spain. 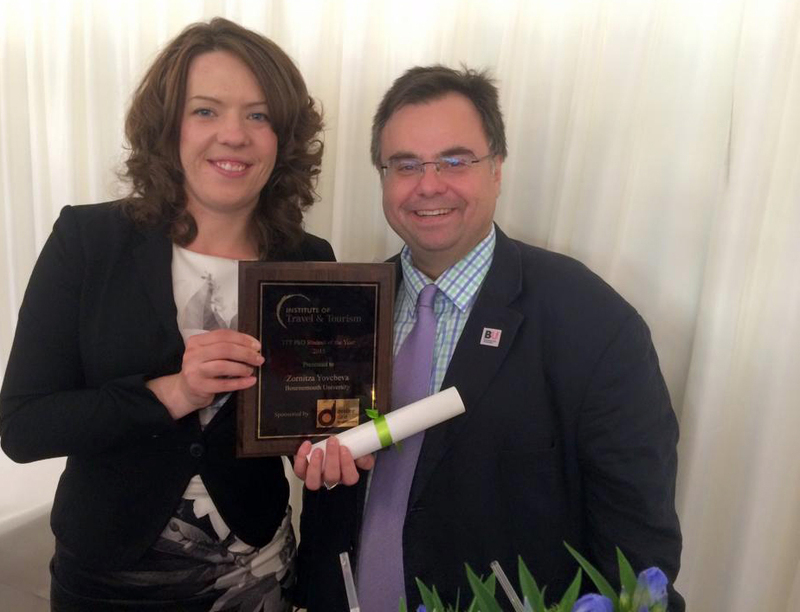 The annual Institute of Travel & Tourism (ITT) Student Awards recognise the travel industry’s talents. 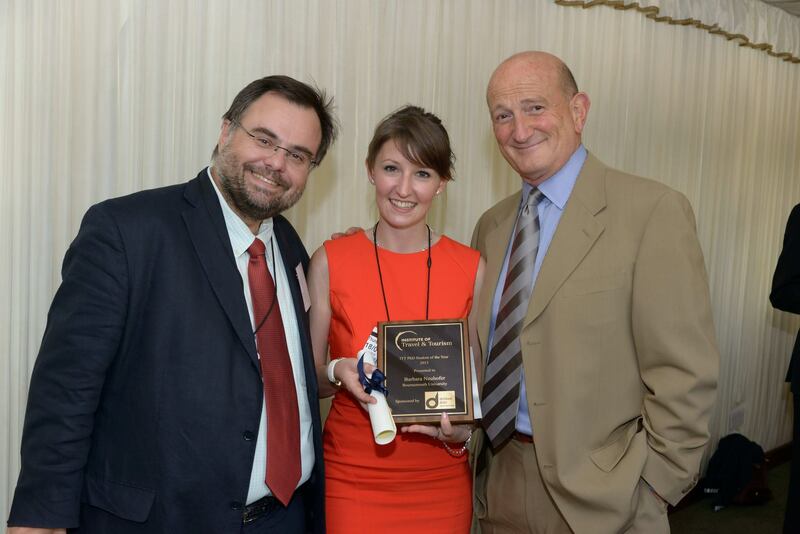 This year the member of BU eTourism Lab Zornitza Yovcheva has received the ITT PhD Studend of the Year award at the House of Commons in recognition of her outstanding work and talent. The ITT is the only professional membership body for those employed in the travel and tourism industry, and is dedicated to developing and maintaining high professional standards. Zornitza won the award for her PhD work into how augmented reality applications could enhance the experience of tourists. The PhD thesis supervisor Professor Dimitrios Buhalis said: “Zornitza’s research is cutting edge and I am glad her work is being recognised by ITT. Augmented reality will change the way we consume tourism and will be instrumental in the co-creation of memorable tourism experiences”. The awards were presented by Lord Snape at the ITT Summer Party in the House of Commons. Barbara Neuhofer has been selected as this years Institute of Travel and Tourism PhD Student of the Year by the ITT Education and Training Committee. The presentations of the awards took place during the ITT’s annual Chairman’s Summer Cocktails, in The Terrace Pavilion at The British Parliament at the House of Commons on 18 July. The Awards recognise the travel industry’s up-and-coming talent and illustrate ITT’s on-going commitment to the collaboration of education and Industry through a variety of initiatives. This ever popular event offers ITT Members an opportunity to network in a relaxed environment with 200 industry colleagues. The Rt Hon Dame Tessa Jowell MP will be attending the event to introduce the ITT Student Awards. 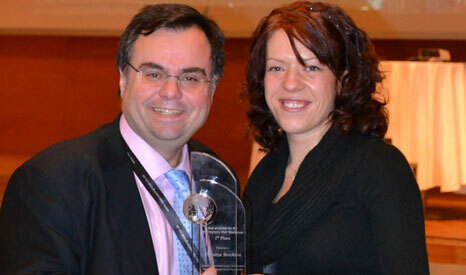 Dimitrios Buhalis awarded 20 Years ENTER Paper Contribution 1st Place at the ENTER2013 @ Innsbruck, Austria. It means that in the history of ENTER Dimitrios Buhalis has contributed the largest number of papers. Followed by his good friends Rob Law from Hong Kong Polytechnic University and Daniel Fesenmaier from Temple University. It reflects his consistent record of publications in the eTourism arena for the last 20 years. It also shows his collaborations with many good colleagues and friends as well as ex-students to produced all this scientific output and has helped to establish the area. It was also a great pleasure to see one of the PhD student Soultana Symeonidou to win the “Best PhD Proposal Award” 3rd Place. And the work that Soultana is doing on Context-Based Mobile Marketing For Tourism Businesses is innovative, cutting edge and ground breaking. Well done Soultana Symeonidou! Enter 2013 ran from Tuesday 22nd – Friday 25th and celebrated 20 years of continuing contribution and ground breaking interactions within the IFITT community. The ENTER conference, organised by IFITT, offers a worldwide and unique forum for attendees from academia, industry, government, and other organizations to actively exchange, share, and challenge state-of-the-art research and industrial case studies on the application of information and communication technologies to travel and tourism. Babara Neuhofer, PhD student at the Bournemouth University eTourism Lab won the 2nd Prize of the PhD Workshop Best Proposal Award at ENTER 2012, held in Helsingborg, Sweden on 24th to 27th January for her proposal entitled “Revisiting the Tourist Experience: An exploration of the essence of the technology-enabled enhanced tourist experience”. The annual PhD Research Workshop at the ENTER conference was attended by doctoral students from all over the world who are undertaking research in information and communication technology in the tourism industry. The ENTER 2012 conference was run by the International Federation for Information Technology in Travel and Tourism (IFITT), the leading independent global community for the discussion, exchange and development of knowledge about the use and impact of ICT in the travel and tourism industry. Barbara’s research, supervised by Prof. Dimitrios Buhalis, Prof. Adele Ladkin and Dr. Scott Cohen, focuses on exploring how technologies can be used to enhance the tourist experience for the tourist throughout all stages, i.e. pre/during/post, of the travel process. The notion of consumers increasingly striving for experiences constitutes a prevalent concept in today’s experience economy. The significance of experiences in both tourism research and practice has been acknowledged by literature in the past. However, given the recent impact of technology on tourist experiences, there is evidence for a prevailing insufficient understanding of the experience in a technology-mediated context. Considering that the changing nature of the tourist experience needs to be understood in order to create and deliver competitive experiences in the future, a revision of the concept is indispensable. Based on this rationale, the doctoral research aims to explore how technologies can be used to enhance the tourist experience for the tourist throughout all stages, i.e. pre/during/post, of the travel process. Theoretical contribution in terms of developing a holistic framework to understand and measure the Technology Enhanced Tourist Experience by adopting a mixed methods approach will be provided. For further information on Barbara’s research project. View Barbara’s PhD Research Poster: ENTER 2012_Poster Presentation_Barbara Neuhofer. For further information on ENTER2012 go to: http://www.ifitt.org/congresses/website/enter2012/Home_page. 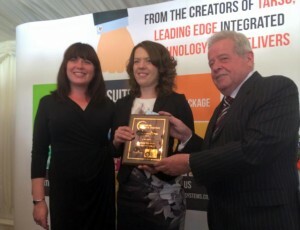 A student from the John Kent Institute in Tourism has won the top award at this year’s prestigious Enter 2011 PhD Research Workshop. 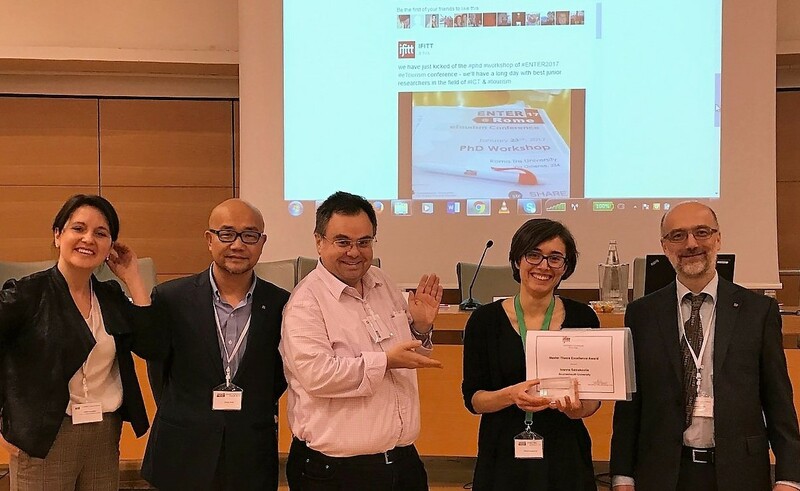 Zornitza Yovcheva won First PhD Prize for her current research into three-dimensional mobile, context-aware applications for tourism at the international etourism conference held in Innsbruck, Austria. John Fotis, who is also a PhD student and a part time lecturer in the School of Tourism, was awarded the Third PhD Prize for his ongoing research into the impact of social media on consumer behaviour. The annual PhD Research Workshop was attended by doctoral students from all over the world who are undertaking research in information and communication technology in the tourism industry. The workshop is part of Enter 2011, which is organised by the International Federation for Information Technology and Travel & Tourism (IFITT). View Zornitza’s PhD research poster for Enter 2011, which is about finding ways to improve the usability of context-aware, three-dimensional mobile map-based applications for urban tourism. View John’s research poster about his PhD, which aims to develop a comprehensive framework / model describing the impact of social media on the purchase decision making process.